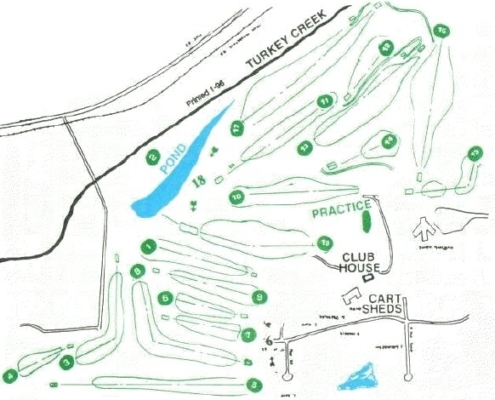 Crestwood Hills Golf Course is a Private Stock Holding course open to the public. At Crestwood Hills you will enjoy a 40+ year, beautiful 18 hole course bordered by Lake Anita State Park, Iowa’s famous rolling hills as well as the local airport. Drive or fly in today for a round! If you have not been a member of Crestwood Hills for any of the previous 3 years, you can be a member for 2019 for $300.00 (single) or $350.00 (family). Call us today! 1. USGA rules govern all play except for local modifications. 3. Winter Rules – Improve lie by hand or club in your fairway only. 4. Out of bounds area is boundary fence on south side of No. 5 fairway and cart path No. 18. Also, road on No. 15 & on No. 3. Ball to be replayed from original spot. One stroke and loss of distance. No. 8 out of bounds from white pole on right side of fairway back to tee box. Out of bounds poles on No. 15 & No. 3. 5. Right side 15, 16, 17 fairways are lateral hazards. 6. No. 2 drop area across pond 1 stroke penalty.